Love is in the air, Lizette Gonzalez and RL Boyd are getting married! 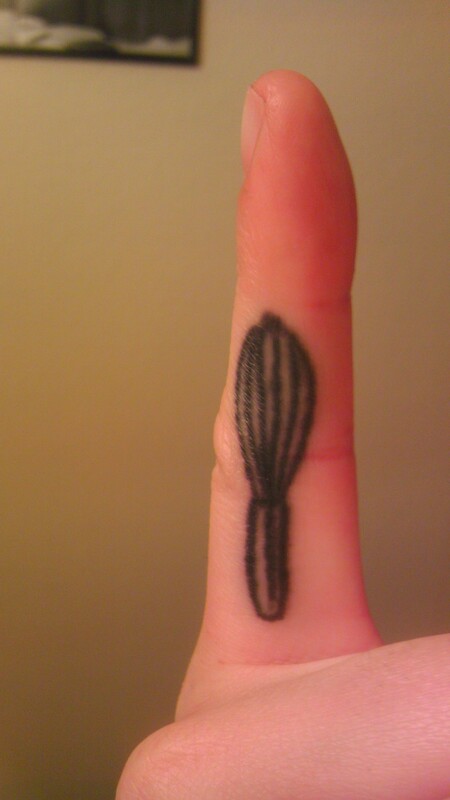 Why is that of any relevance to knives and needles, you might ask? 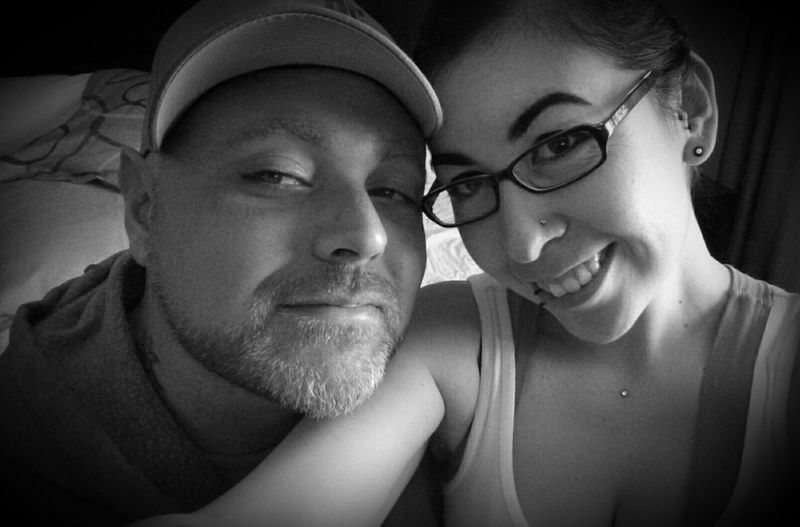 Because they met through this blog! 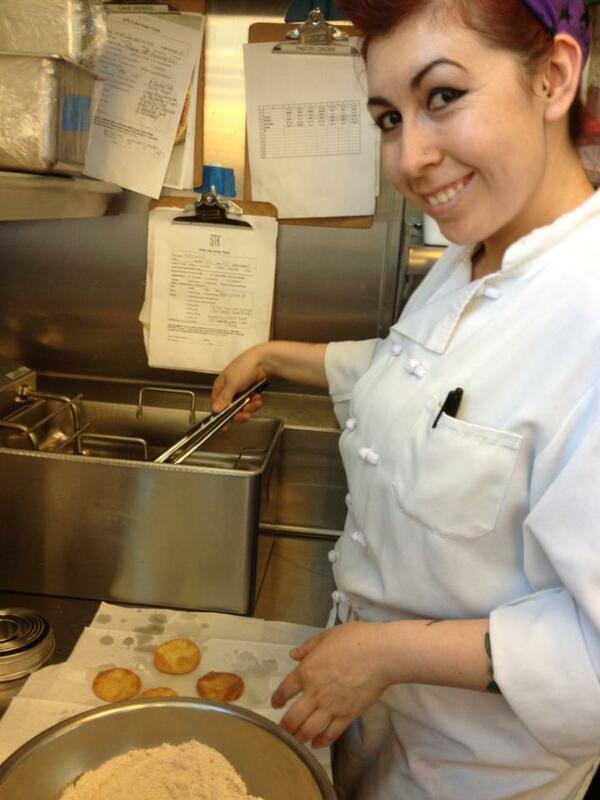 Lizette is an uber-talented baker and I interviewed her last year. We follow Chef RL Boyd on instagram and have featured some of his mouth-watering food photos. RL saw Lizette’s Knives and Needles blog interview, took one look at her beautiful photos and requested her friendship on IG. 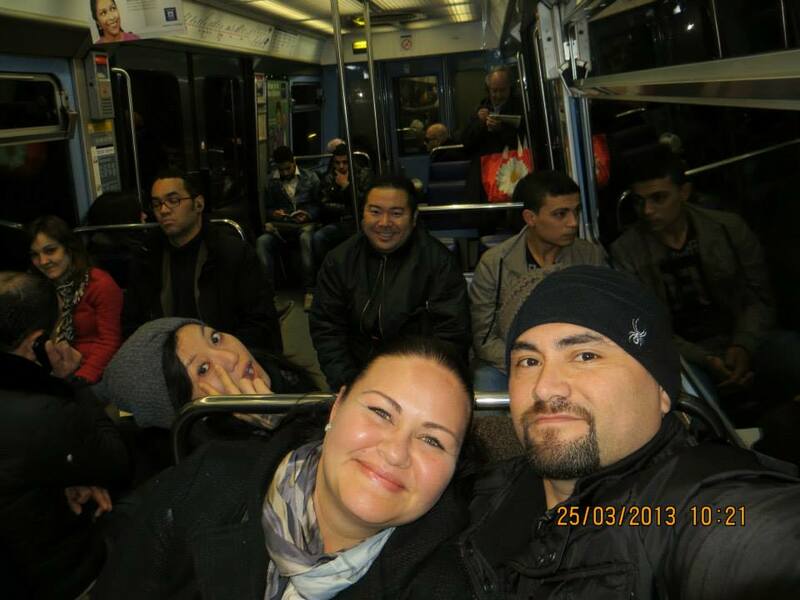 IG led to Fb friending which led to chats, long phone conversations and finally leading up to a love at first sight meeting (Lizette lives in Vegas, RL in D.C.)! 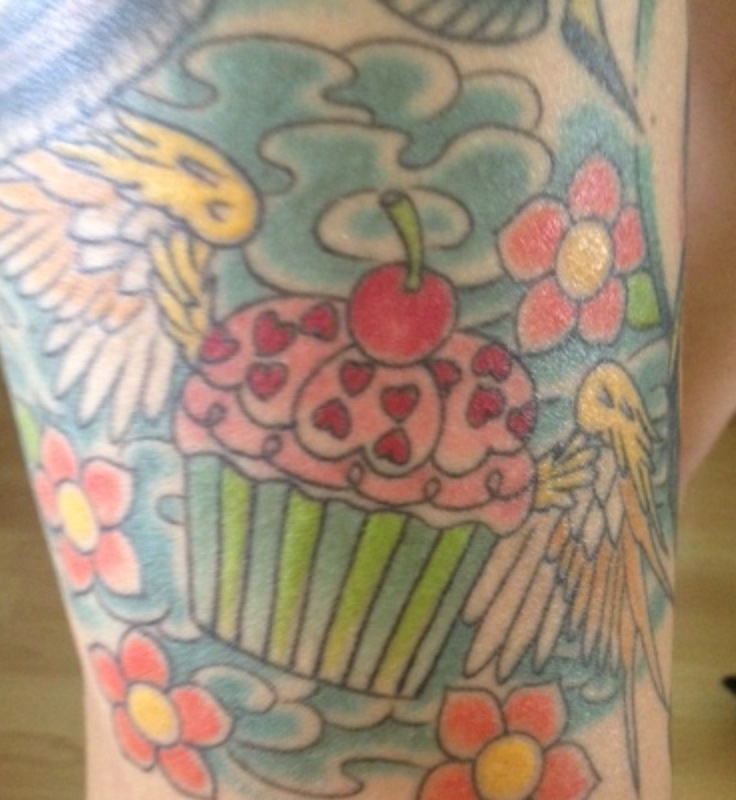 Please check out LIzette, RL, their food (respectively), and of course their tattoos! 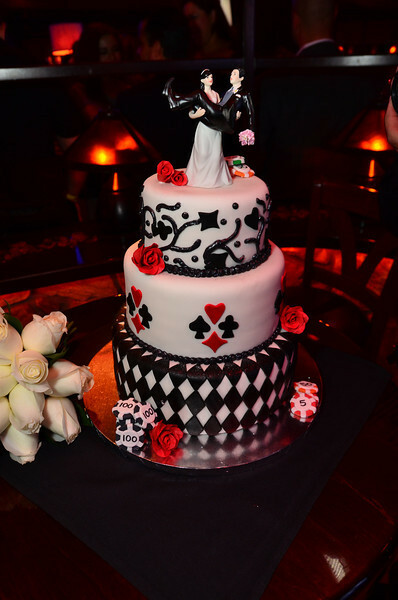 Congratualtions Lizette and RL, we wish you an eternity of happiness and love!! Thank you for sharing your story with us!! Steve Looney and his family are our family. 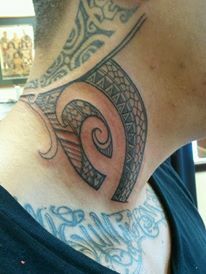 He is an incredibly talented tattoo artist (he does some of the best Polynesian tattoo work out there!) and every time I see something he is working on I am blown away! 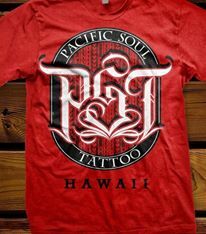 But his many talents extend way past the doors of Pacific Soul; his tattoo studio out in Honolulu, Hawaii (I know, right?! Uh HEAVEN!). 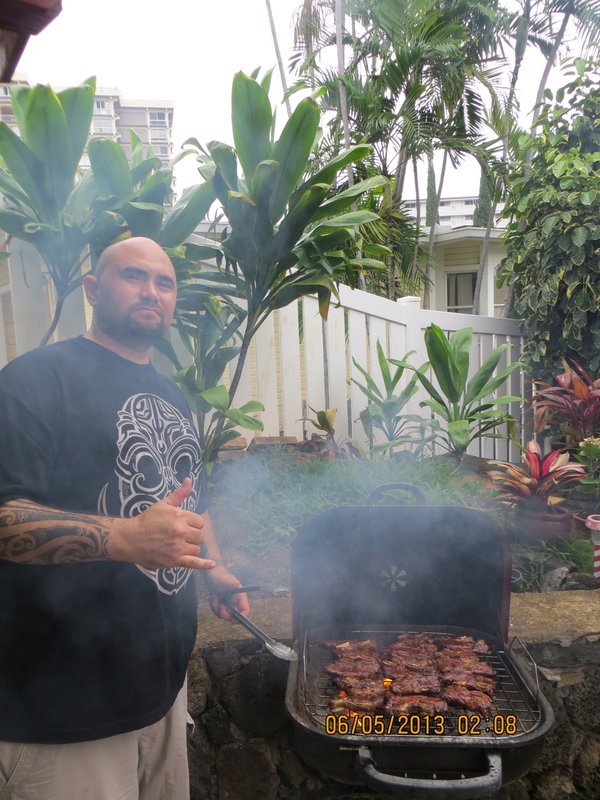 One of the many talents Steve has is that he is one of the best grillers I have come across in my many years of cooking professionally. His teriyaki burgers rule and his short ribs are the stuff legends are made of. Taki and I (and any fortunate friends we bring along) are so spoiled when we visit them on the island. 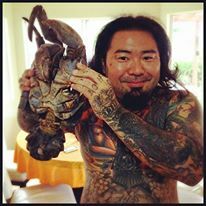 We always the best and most interesting food whenever we visit, from coconut crab (a land crab that eats coconuts, Google them- you will be amazed!) to the above-mentioned grilled treats. 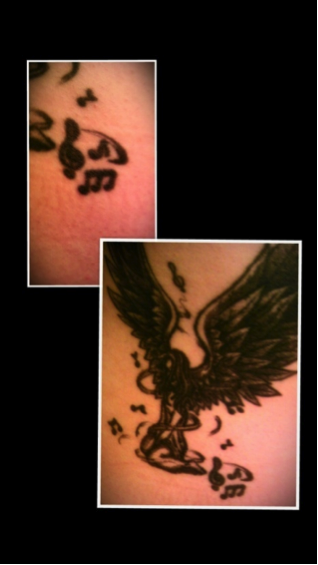 Thank you Steve and Dani!! 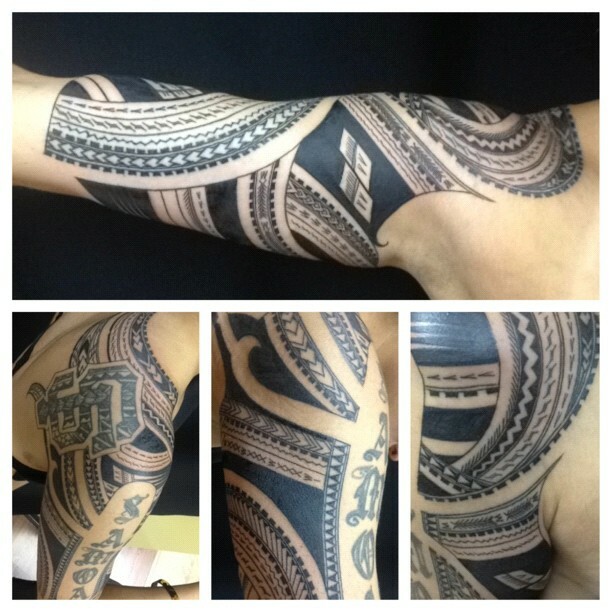 Check out Steve’s Samoan BBQ recipe and some of this incredible tattoo work!! 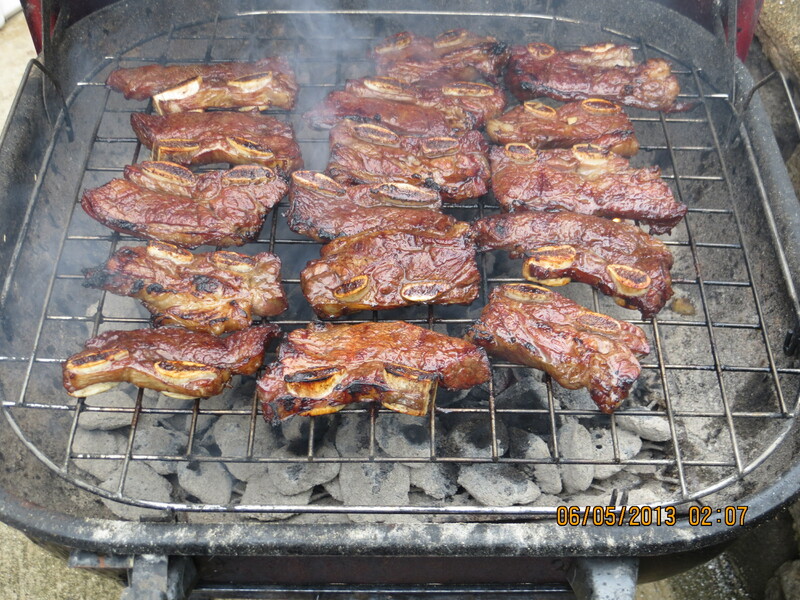 This is for a small bbq (2-4ppl) so multiply recipe for larger bbq parties! Sesame seed oil 3 heaping tbl sp. Fresh chopped Ginger or minced in a jar 1 heaping tbl sp. In a large pot pour shoyu and water and add all ingredients. With your hands squeeze and mash up the ingredients in the shoyu mix. This releases the flavors in the shoyu. 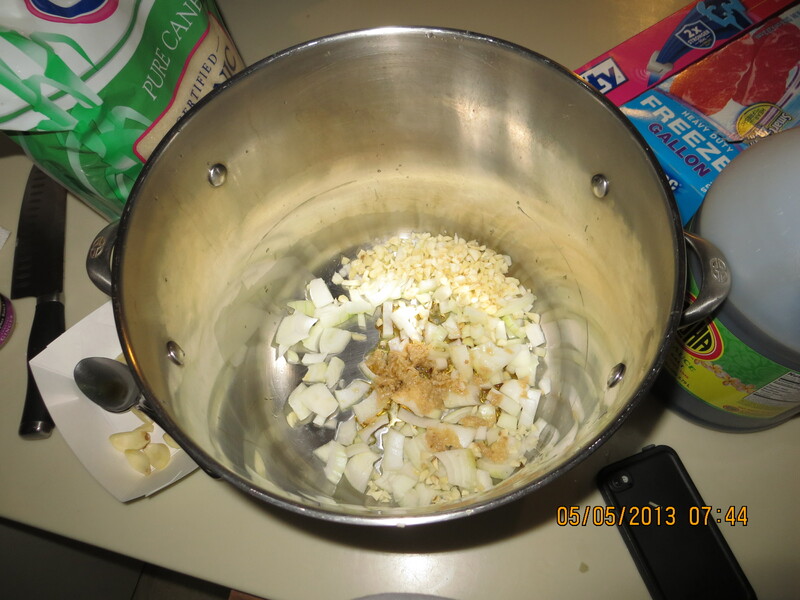 Then put it on the stove and turn to med and let simmer for about 5 min. 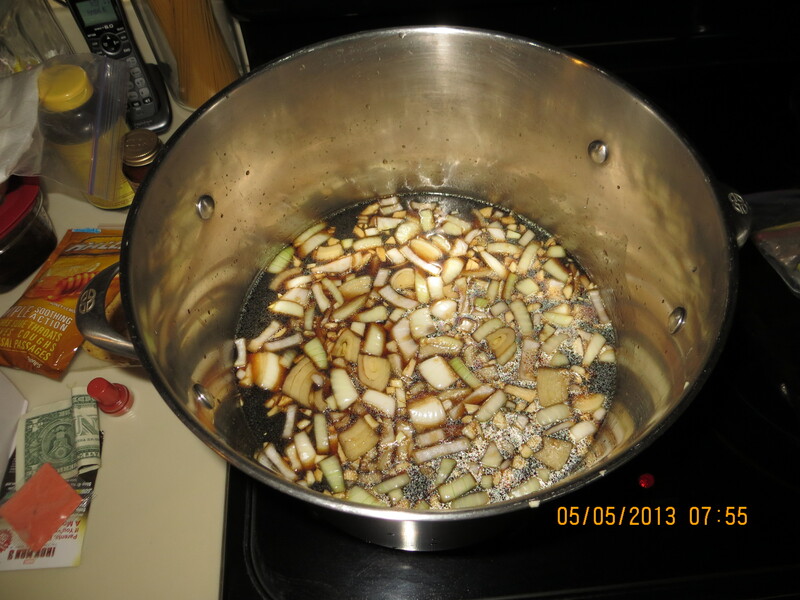 After simmering, pour in to another pot so will cool down faster. Add chicken about half full in 2 gallon ziploc bags as well as ribs in it’s own bags halfway full. 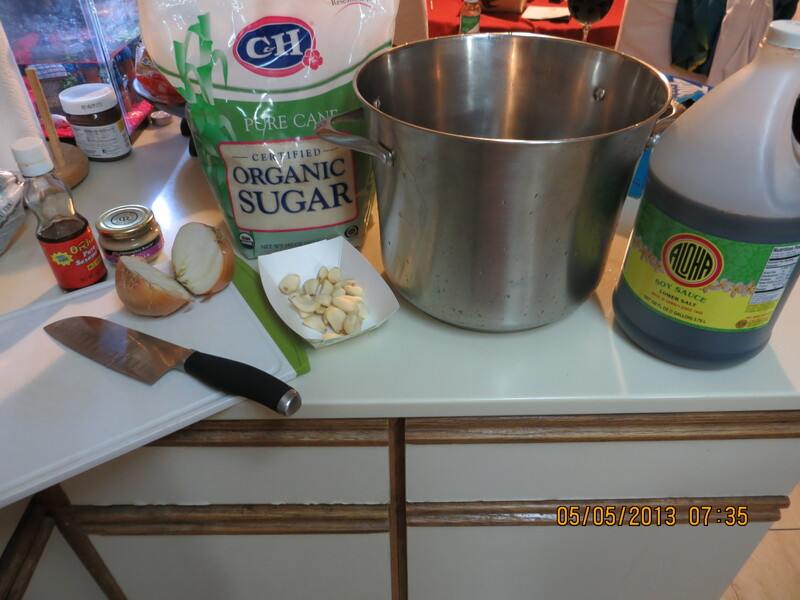 After it cools down pour marinade in large 1 or 2 gallon bags with chicken in it. Then in a 1 or 2 gallon bag for ribs to fill just over the ribs and chicken. Refrigerate for at least 4-6 hours or even overnight. 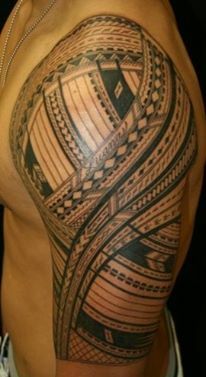 Feeds about 20-25 or about 10 Samoans maybe less if over 300 lbs. Thank you Steve for the bbq inspiration!! We would love to promote your work in the kitchen or in the studio! Thanks for reading, have a great day!! 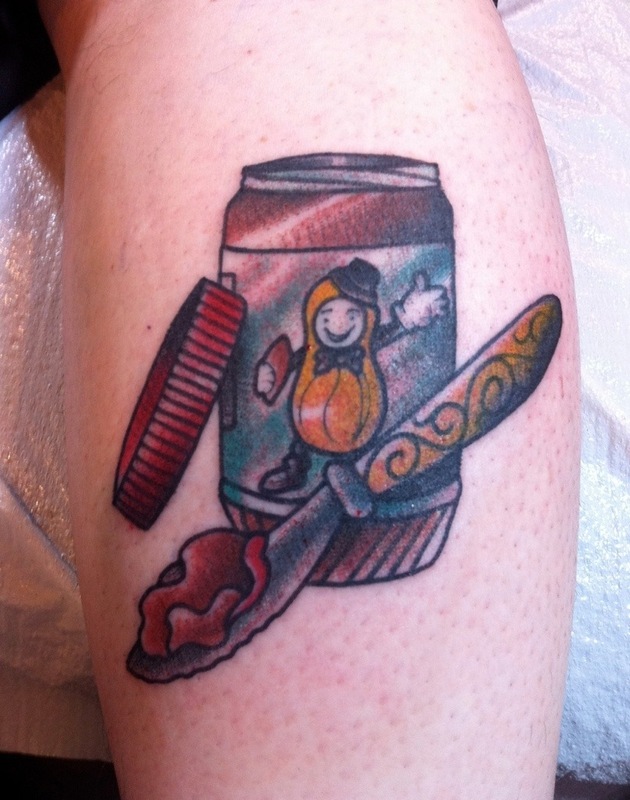 Ryan Davidson gave us this rad sandwich for Tattoo Tuesday! 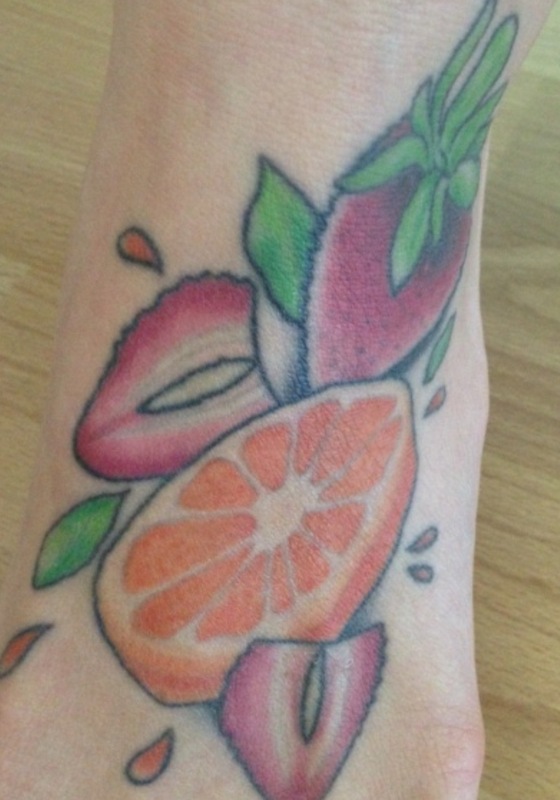 Thank you, Christie, for sharing your food tattoos with us! Check out her blog, http://fitlittlefoodie.tumblr.com/ for some healthy cooking ideas! Growing up in a rough part Oceanside, California, Luke Wessman had a hard road to travel to get where he’s at today. 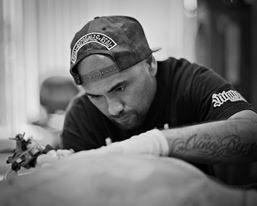 Years of hard work, and artistic talent, have built him and his “traditional gangster” style of tattooing quite a reputation in the tattoo and art communities from coast to coast. Now a fixture at Wooster Street Social Club in New York City, Luke stays humble and sticks to the work ethic that got him to where he is today. 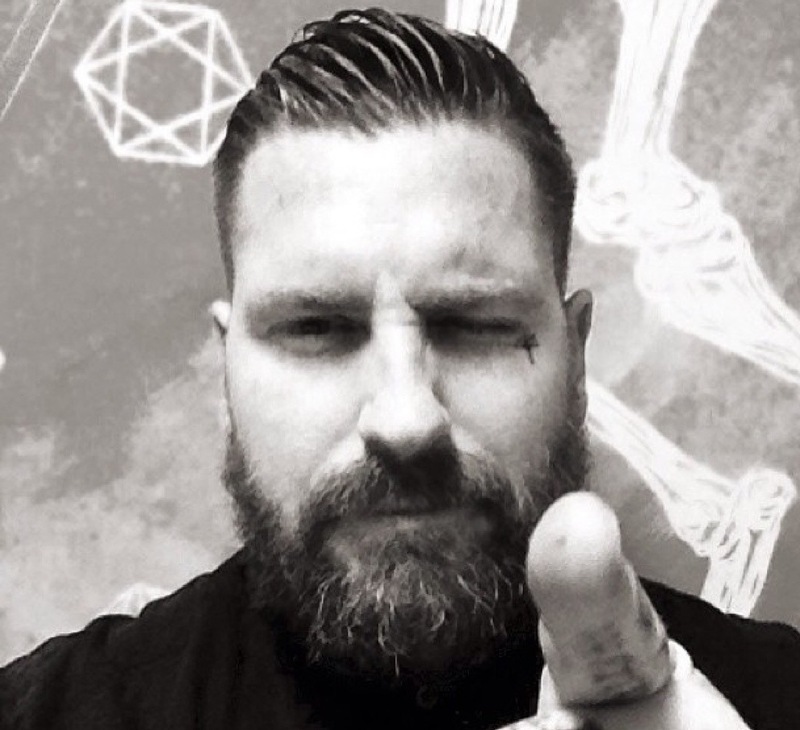 I was so stoked to hear that this self made gentleman wanted to share some of his experiences and tattoos with our readers. Thanks, Luke! 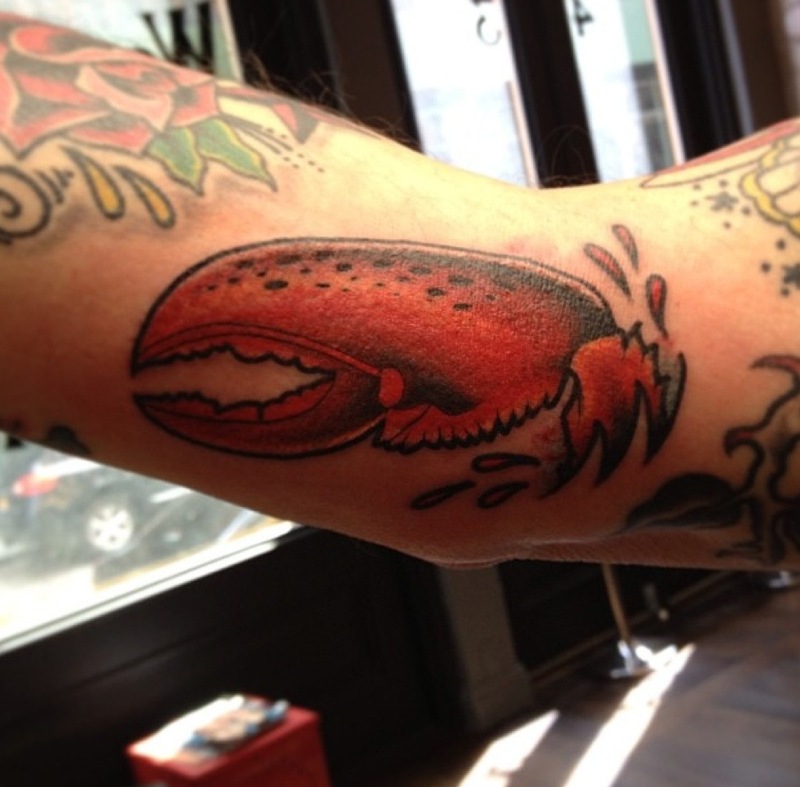 Brynne Palmer- How long have you been tattooing, and how did you get into it? 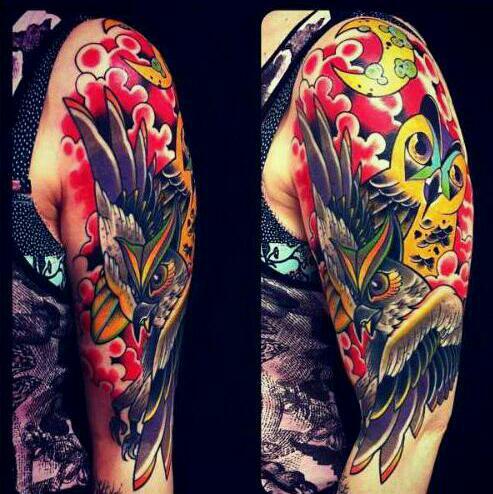 Luke Wessman-I’ve been tattooing almost 15 years now. My older brother’s friend Jason was tattooing everybody in the neighborhood out of his home, and I started getting tattooed by him at 16. 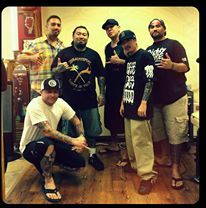 He eventually got a job at a newly opened tattoo shop in our city and it was there that I met some other artist and friends that eventually brought me into the life, forever changing it. 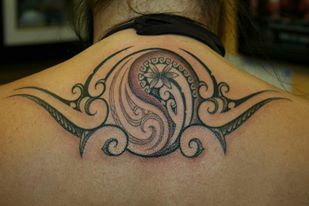 BP- What was your first tattoo, when did you get it and do you still have it? LW- My first tattoo was “Wessman” in Old English across my shoulder blades 18 or so years ago, unfortunately it was covered years back when I started a full back piece. I say unfortunately because the older I get the more I cherish the old ones, but the memories are still there. BP- What is your fondest food related memory? LW-Getting the desserts at this homeless shelter we used to eat at as a kid “Brother Benos” That and the donut plate that was out before church started on sundays when I was little. BP- Your career takes you all over the world, do you have any standout culinary experiences or funny stories from your travels? LW- I was with some dear friends in Milano, Italy for a tattoo convention, we all went to eat at this little restaurant (Italian of course) and this rude server could not grasp that my friend Manako was vegan and what that meant, we literally almost got into a fist fight with this guy in this crowded restaurant because my friend Manako wanted to send back the cheese filled french onion soup. Another memorable food moment, and more positive, was watching my dear friend at the Aspen food and wine festival do sushi at a SWS party and later hearing Chef Nobu Matsuhisa say to him “I hope we can work together one day” which ment a lot to my friend, which means a lot to me. BP- Now living in New York, what are a few of your favorite places to eat? Any good go to date spots? LW- I have a few spots I frequent often, one is called ‘Sons Of Essex” the other is “Schiller’s Liquor Bar” both in the Lower East Side where I live. I get treated very well at both and only a very special lady will I bring to either. BP- Are there any restaurants in your hometown you really look forward to when you get back? LW- Yes, one of my oldest friends Rob Ruiz is head chef at a sushi spot called “Harney”, It’s the best sushi I have ever eaten, served by one of my dearest friends, in the city I grew up in, win win. 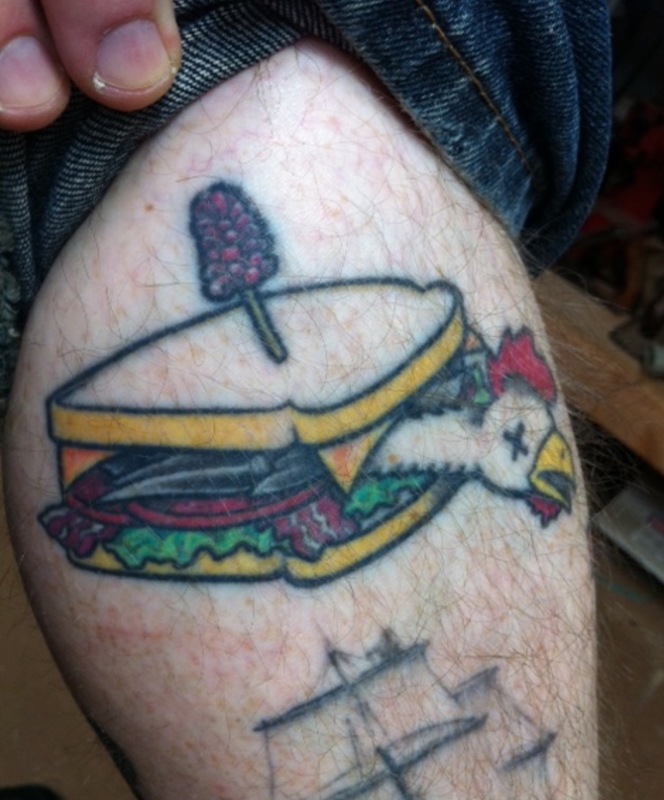 BP- Do you have any chef clients, and if so what have you tattooed on them? LW- I do, I suppose the most notable are, my friends Rob Ruiz whom I have done a lot of work on, and Chef Rick Tramonto I did a big Hammer Stahl knife on his forearm. 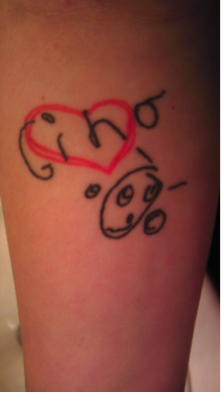 There is a cool video of me tattooing it on Rick on my site. 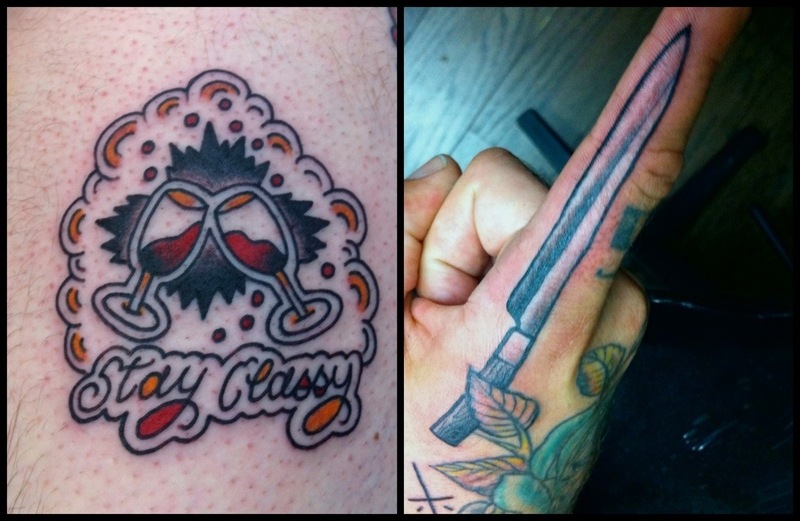 BP- Have you noticed a correlation between the tattoo and culinary industries? LW- Oh yeah big time, it seems to go hand in hand. 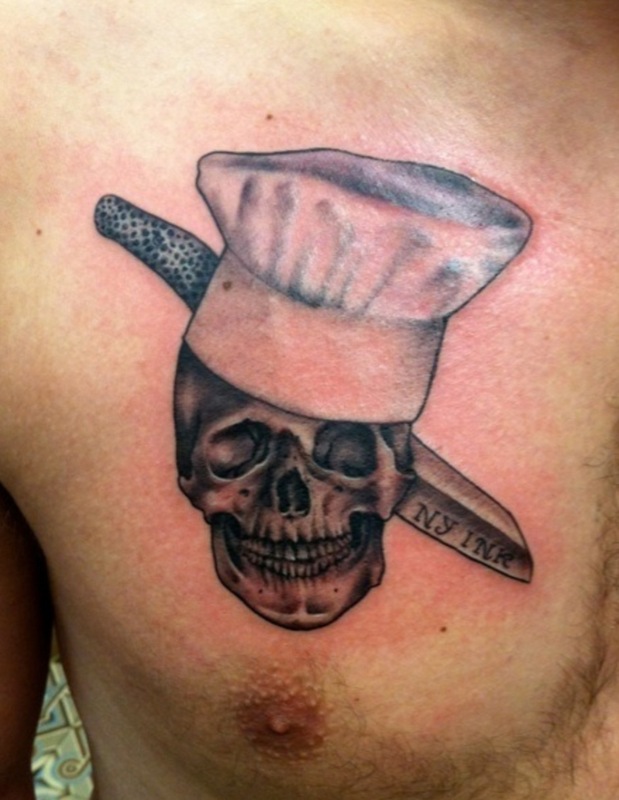 Most chefs I have come across have many tattoos, it seems to be a big part of the chef culture. 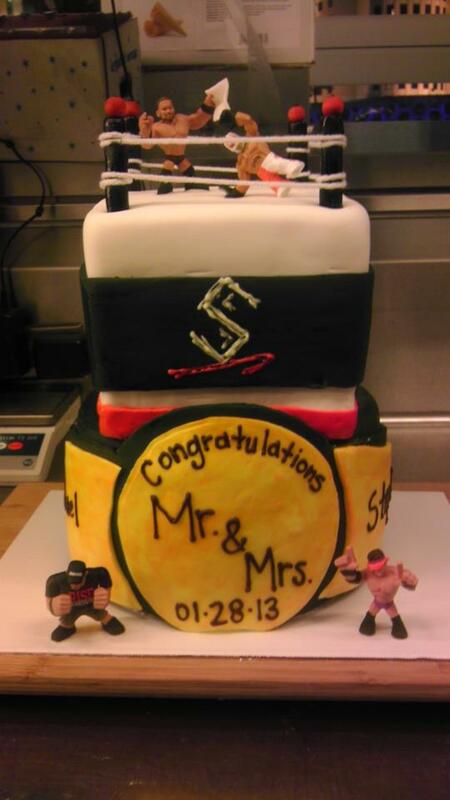 A lot of passion and struggle in the kitchen. The average people have now idea how hard those guys work back there. 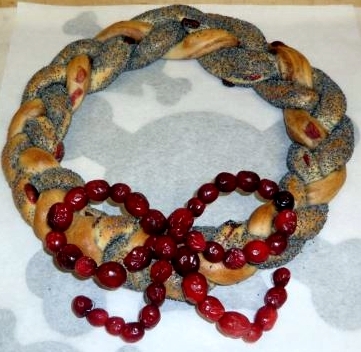 BP- What is your favorite thing to cook at home, and could you share the recipe with our readers? LW- Well now being a bachelor these days, I’m not really cooking too much in my little NY kitchen, I think the most elaborate meal is like a peanut butter and jelly on a toasted bread, and a wide verity of cereals. For dessert I like to eat a Hershey’s chocolate bar with Nilla wafers and some milk. 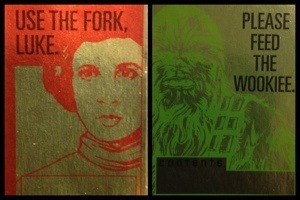 For more of Luke’s work, check out lukewessman.com! Star Wars and I go back a long time ago, not so far way. I grew up in a household that loved the trilogy, and have so many fond memories of it intertwined in my childhood. 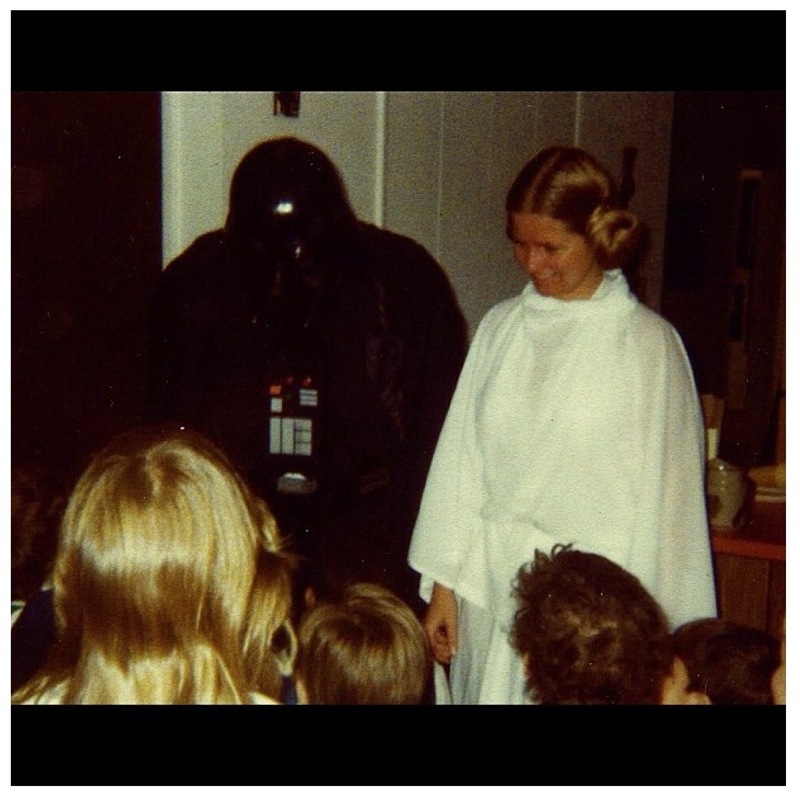 This photo is my second birthday party, my parents dressed up in homemade costumes! After all these years, Star Wars has always been a big favorite of mine, and as the years fly by it only seems to be growing more and more popular! 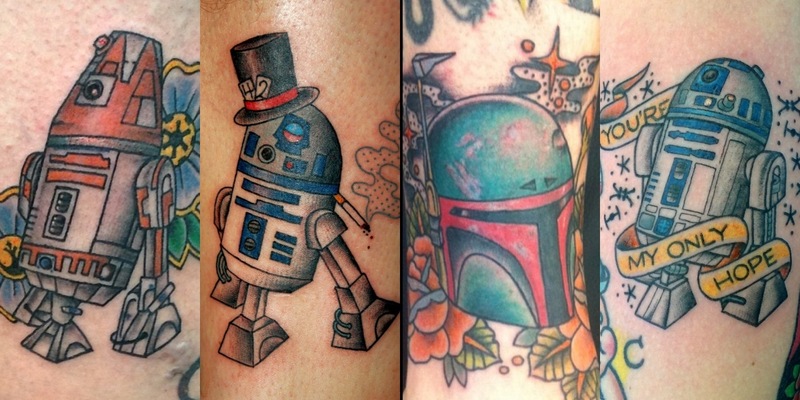 So it’s no surprise that I have been getting more and more requests for Star Wars tattoos. 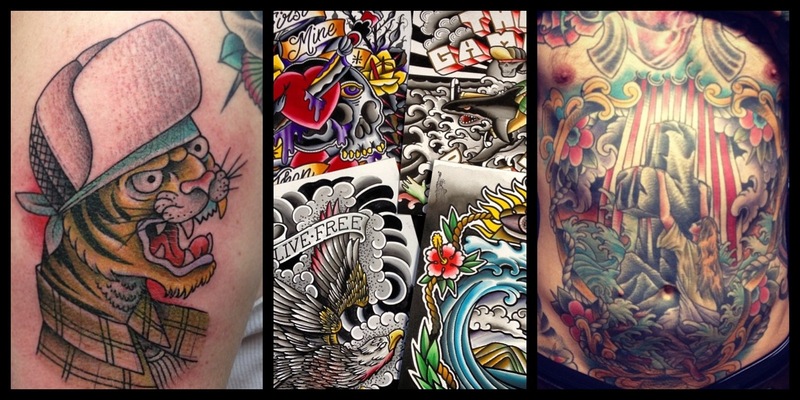 These are a few I’ve done recently…. 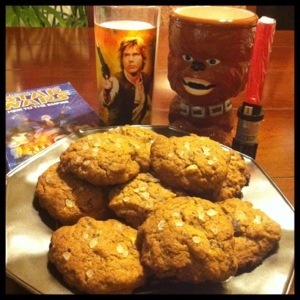 After working on my latest Star Wars tattoo, I wondered how I could relate this phenomenon with our blog, and it dawned on me…Wookiee Cookiees! 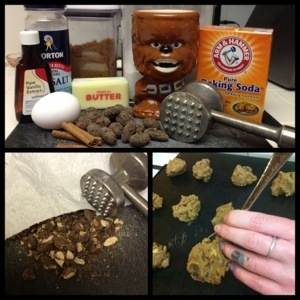 As a few real big nerds like me would know, Chewbacca’s home planet of Kashyyyk exports wheat flour, so I decided to make an appropriate cookie recipe for you to try, hope you like it! 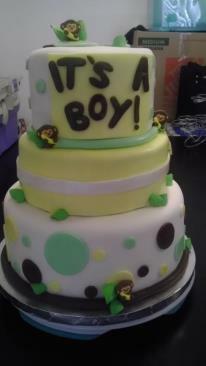 Enjoy with a big tall glass of milk!